Fifteen mails in my inbox, including ones that scream ‘We are going to steal all your money’, and yet I go and open the one titled ‘Lose your Belly Fat’ first. Our builder is already stealing all our money, so I wouldn’t worry about such mails. I remember kiddo telling me that there was a teacher in his school who had a ‘biiiiiiiiigg’ tummy. He stretched his hands to his front and arched himself to show how big the tummy was. I told him that I think there is a baby inside her tummy. Oh, it was so tempting to say yes. It would have been fun to see his reaction. But better sense prevailed and I explained to him in simple words about babies coming from tummies. That was the most embarassing reply of my life! No, there is nothing in my tummy, except tons of fat. So as a result, I have started drinking copious amount of green tea and reading mails that say ‘Lose your belly fat’ first. And while I am fighting with my tummy, I allow myself these steamed low fat quick snack, that won’t do much harm to your tummy. Boil one cup of water with about half a tsp of salt. Take half cup of rice flour in a bowl. Add the boiled water to this, little by little and mixing it with a spoon. Donot add all the water in one go, because you may not need the entire quantity. Stop once the rice flour reaches a semi solid consistency – a little bit watery than chapati dough. Wait until the dough is cool enough to handle, but don’t let it become ice cold or it will become tough. Take a pinch of the dough, roll it into a marble sized ball. 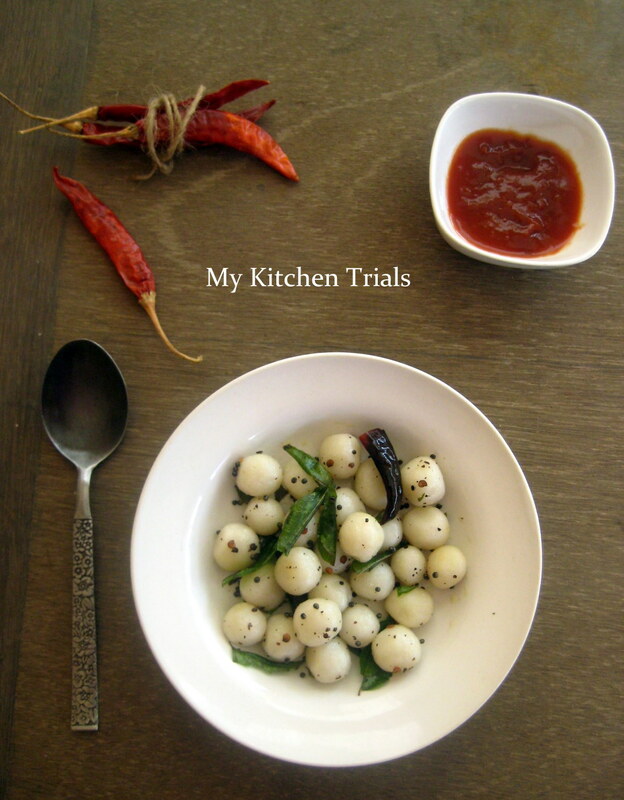 Form about 15-20 small balls and steam them for 10 minutes, till they are cooked and glossy. Make sure that they don’t overlap or touch each other when they are steamed, as they will fuse together and you will have to break them apart. Heat one tsp of oil. Add mustard seeds and red chilies. Once they splutter, add the urad dal and curry leaves. Add the steamed kozhukattai and mix carefully, without breaking them. 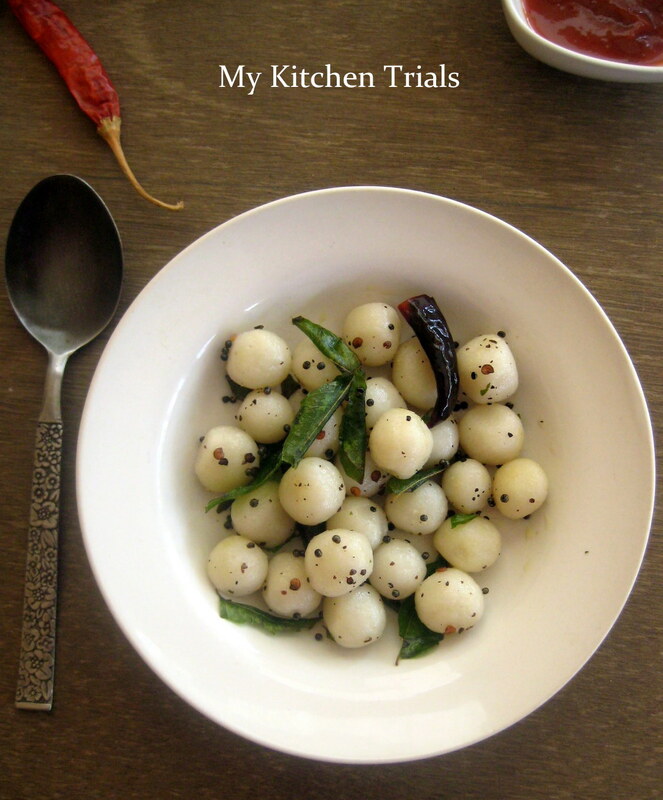 Serve hot with coconut chutney or tomato ketch up. Sometimes kids give us such a honest feedback that we are not prepared to hear it. 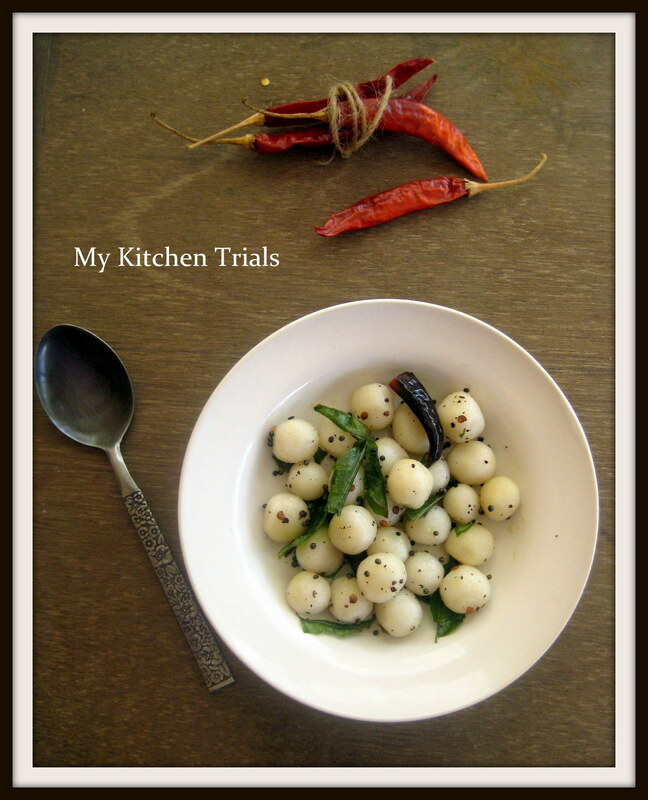 Kozhukattai’s look super ….yum yum!!! ha ha.. i was just imaging what ur sons expression when u had told him yes he did.. ha ha.. poor thing would have freaked.. i love these kozhukattai’s.. def healthy.. ohh belly fat..dont even remind me of it !! Lol! My son asked me a similar question about how came to be in my tummy..before he asks me the next question, i better reduce my belly fat. He He. Hi Dear. Lovely post and well narrated. I love the small beauties, so adorable. Pls update the post with the logo as that’s mandatory. Thanks for linking. I have faced similar questions as well :)..